Disability Insurance replaces a portion of your income if you become unable to work because of a covered illness or injury. This income can help you continue paying for every day expenses. Short term coverage generally has a brief waiting period and set benefit amount that may last anywhere from one month to two years. Long-term coverage has longer waiting period than short-term coverage but could last anywhere from a few years to a lifetime. 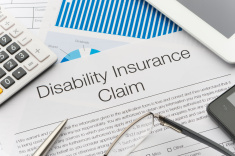 Individual disability insurance policies are perfect for those who do not have employer provided disability insurance or, some carriers offer coverage without a waiting period, which compliments your employer provided disability insurance. PLEASE CALL US FOR MORE INFORMATION OR AND A QUOTE ON DISABILITY INSURANCE.